Only few days are left for 2013. All of you must have already made plans to welcome the New Year, but have you made any plan for your better financial life in the New Year? The answer to that would most certainly be “NO“. Most of you do your investment without proper planning and these investments ends up in a mess. You should ask yourself “whether these investments are best suited to my financial goals”. If the answer is ‘Yes’ then you do not need to review your investment portfolio but if the answer is ‘No’ or you are not sure about it, then you must review your portfolio before it gets too late; as the longer you hold these the more you will loose on the returns on your investments. Contingency fund is the amount which you should always keep in your savings bank account for any unfortunate event. Unfortunate events can be medical emergency, loss of job or can be any other thing for which you have not planned for. Though you might say I already have 50-60 thousand rupees in my bank account, but it might not be sufficient as it is always advisable to keep between 3-12 months of expenses as contingency fund. Many people are unable to achieve what they want in life, because they don’t know what they exactly want. So you should sit down with your family, consult with them and decide what financial goals you should be targeting for various stages of your life. The financial goals which are applicable to most of the people are Retirement, Child Education, Child Marriage, House purchase etc. but the more difficult part is to decide how much amount you require as on today and in how much time do you want to achieve these. You should have a clear vision of your financial goals as your investment in any financial product is totally dependent on your risk taking ability and time horizon set for your financial goals. If you are the only earning member in the family then the financial future of your family is dependent upon your income and if in any unfortunate event something happens to you then your family’s financial future will be in jeopardy. So you should adequately insure yourself and buy a Term Insurance policy which will protect your family’s financial future in your absence. If you can review your existing investment, create a contingency reserve, decide on your financial goals and its amounts, protect your family’s financial future through a good Term insurance policy and decide on where and how much to invest, then you do not require services of an investment expert or a financial planner. But if there is anything which is beyond your own expertise or you do not have time to manage it then you immediately require services of a Financial Planner. Financial Planners are an expert in managing personal finance just like doctors who manage your health issues. Financial planners can do a detailed study of your financial goals and can create a customized financial plan according to your own financial requirement and give you the right direction to achieve each of your financial goals. If you follow the above mentioned steps rigorously then it will definitely improve your and your family’s financial future in the years to come. If you think you need any assistance in implementing any of the above mentioned resolutions then feel free to call certified financial planner. 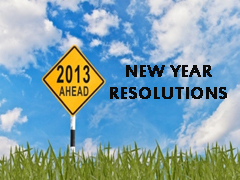 Do post your financial resolution in comment section.